We don't necessarily have a minimum or maximum job cost, but we typically work with clients on creative solutions for their home design or renovation projects in this range. We had a wooden deck/balcony which I had added to an addition over our garage built in 1981. We live in the Mt. Soledad foothill area of Pacific Beach and the deck allowed us to take full advantage of the view. The deck had some termite damage and dry rot and needed to be refurbished or replaced. 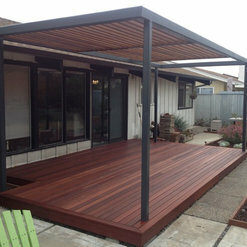 An Internet search identified Full Circle Design & Remodeling which specialized in decking in the San Diego area. We contacted the company and met with owner/operator, Jeff Howard. 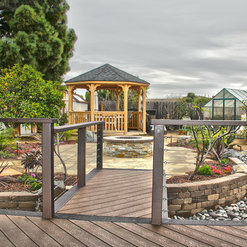 We told Jeff of our vision for a replacement deck---- a deck about 4 times larger than that of its replacement; materials requiring little; if any, maintenance; railngs which didn't obstruct the view and one that would be incorporated into the front of the house and enhance the whole entryway. 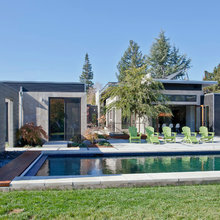 We found Jeff to be a very creative, knowledgeable designer able to turn a client's desires into reality while addressing many circumstances which required solving challenging interfaces associated with an existing 1962 vintage house. Jeff's employees were punctual, hard-working, resourceful and competent. Unanticipated issues which were found and resolved included old footers/sewer cleanout; gas leak in a rusted line servicing an inside fireplace and drain pipes which were clogged with tree roots and broken. 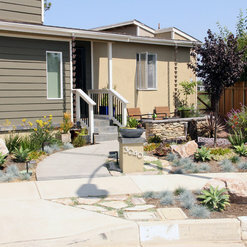 Jeff put on his landscape architect had and came up with a planting palette which replaced mature plantings with a xeriscape front yard area. A new gas line was installed under as existing side walk . 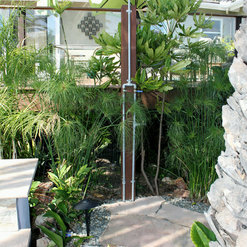 A new drain pipe was installed requiring cutting hardscape in the back yard and continuing all the way out to the street. The result was a beautiful new, much larger deck incorporated into a new more contemporary front entranceway with a new front yard and a drainage system which avoids lakes in the back yard every time it rains. 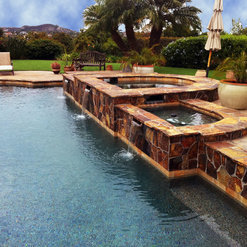 We have no reservations about recommending Full Circle Design & Remodeling. Schedules/deadlines were met and work accomplished within associated budgets. The results met or exceeded expectations. 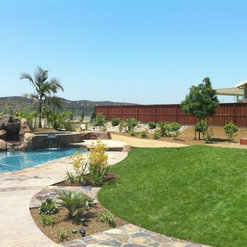 Jeff designed and landscaped the entire yard (front and back) after a complete home remodel. 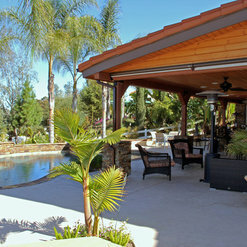 He installed artificial turf throughout the yard, added walking paths and fruit trees to existing landscape, and installed a batting cage, pitching mound and a custom BBQ island. Jeff worked with me on the plant selection, and the different media available for the foot bridges, stone walls, and turf. 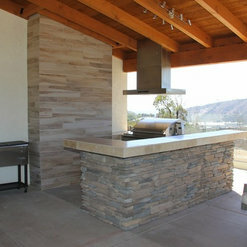 I highly recommend Full Circle Design and Remodeling. Full Circle Design recently demo'd our back and side patio to lay concrete with a roman stamp and install a built in BBQ island with both electrical and gas lines. I was surprised by how quickly the crew was able to remove the old patio and prep for the concrete. The foreman and contractor found some areas where the previous owner of our house did not install features by the book and advised the options we could take to address while keeping us in close contact and ensuring we approved of the direction taken. The concrete was laid extremely quickly with an extensive crew to complete that part of the contract. After the concrete had a few days to set, they began work on the island. 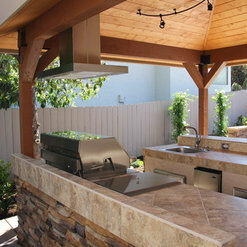 We had initially decided to buy a prefabricated island but were happy we went with Full Circle Design because we were able to pick our exact design, tile combination, grill, and features like a fire pit for a lower price than what we had compared with the prefabricated unit. Total duration of the project was only about two weeks, quicker than others we compared when researching which contractor to use. Overall we'd give this company two thumbs up and would recommend their services to others. We'll probably contract with them again for redesign work in the front yard now that we're enjoying our new found back patio. FCD did a complete redo of our old backyard and we couldn't be happier! The design of the two tiered Trek deck, installation of the cover, the lighting, the landscaped garden area came out perfect. Jeff did a plan and estimate for us. It was a little out of our budget but Jeff sat down and worked with us to get the price within our budget. Even with the scaled back plan the overall effect of the design was not compromised. 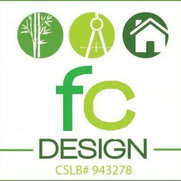 We would recommend FCD to any one who asks. We had a fairly complicated job that required new decking, an enclosed garden area, patio cover and many miscellaneous repairs - all of which had to integrate with work done a few years earlier by a much less qualified contractor. The pleasant surprises began with Jeff Howard's design which was much more creative than anything we had imagined - and actually saved us money. Jesse, our supervisor, stayed on top of all the details and kept the work moving and Jeff's crews turned out very high quality work - the best we have ever had. We are doing some more work now, and we didn't call anybody but Full Circle Design. Hired Full Circle Design to design and build my outdoor deck and backyard garden. 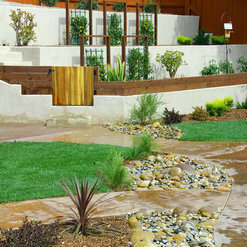 Appreciated their ability to both do the "hard and soft scape" of the project. Really know their stuff and take great pride in their finished product. Always professional, their crews (really) clean up after EACH day of work (impressed my wife with that). And they made sure we were absolutely happy with their results. We were so impressed with their work that we have recently used them on some remodeling jobs for the interior of the house. Again great work. Jesse Krueger did an amazing job of planning and supervising our project which included a fire pit and re-landscaping of our back yard. It was completed on time and within the budget. I would highly recommend him and your company! 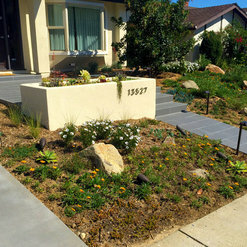 Jeff redesigned my front yard landscape from design concept to installation. I now have a low maintenance yard that exceeded my expectations. He has also helped me troubleshoot with some issues I had and came to the rescue. He takes pride in his work and his customer service is awesome! Commented: Surface materialSorry, missed this question a while back. 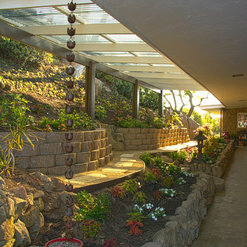 It is a ceramic tile over concrete driveway to make bands and walkway. Commented: office location on propertyYes, the residence is down the hill from the hillside office and deck. Commented: Love the number font & colorhttp://modernhousenumbers.com/collections/numbers-and-letters We got them at this website I think. It has been a while since we finished this project. 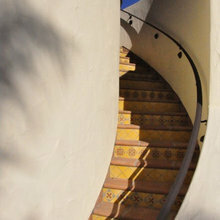 Commented: Where is the pot on top of the column from?There are many places to get similar glazed pots with succulents. You could get everything you need at a Home Depot or most nurseries should have something similar too.